Why is GREEN the color to represent Gastroparesis / DTP ? BELOW IS A COPY FROM A FACEBOOK POST FROM G-PACT. WE WOULD HAVE SIMPLY PUT UP A LINK, BUT SOME OF YOU DO NOT HAVE FACEBOOK ACCOUNTS. THIS QUESTION IS ASKED A LOT AND WE FELT IT WAS BEST TO COPY THE ENTIRE POST. Most people think that green and yellow became the colors for DTP because green is associated with nausea, vomit, bile, and a greenish appearance when sick. Actually, G-PACT places a stronger meaning behind the colors. We gave them a lot of consideration when we selected them to be the official colors for our use to represent gastroparesis. They represent how we want patients to see the future and what we are all trying to accomplish with hope, strength and growth towards better treatment options. We have seen a lot of growth in this field since our founding in August of 2001, so the green is appropriate. Why? Green indicates growth. We are growing towards a cure and awareness and research is growing. It’s a color of hope. When things start turning green outside it indicates the end of the cold, long, dark days of winter. The first sign of green plants and grass indicates we are coming out of a time if darkness and coldness and entering a phase of growth and brightness. It is a color that shows brighter and beautiful days are ahead. There is something really encouraging when you see that first blade of green grass or green leaf peaking through after months of brown fields, trees, and no growth. G-PACT is a grassroots organization meaning that we started with a small handful of patients who were coming out of a period where there was very little knowledge and very little hope towards any kind of understanding or a cure. We knew something needed to be done to provide services to patients to get through the tough times now, and provide hope as we also fight for awareness and research and help bring about greater understanding into this condition. Our initial motto was “Striving towards brighter days of treatment, knowledge, and a cure.” We have grown into a much larger scale, now making an international impact and have provided hope to so many as they try to cope until we do find the cure. Yellow was also an important color for us. Our logo is a sun to indicate hope and a brighter future ahead. The sun is a crucial factor that helps the plants grow. It brightens the days and brings with it the nutrients, strength, and oxygen needed to supply the plants with what they need to be able to grow and thrive. When you wear green, make green things, or do anything with green or yellow for DTP awareness, you are helping things grow and bringing a brighter future and hope to all of us who are suffering from any or all forms of Digestive Tract Paralysis. We are pleased people like the colors we selected and have adopted them into the things they do for DTP awareness. And now you know why! Thanks for helping us see growth in awareness and research by supporting us! IF G-PACT.ORG WANTS US TO REMOVE THIS POST, WE WILL ACCOMODATE ACCORDINGLY. I just received in the mail The Tender Tummy Cookbook. It is the 2nd cookbook produced by G-PACT.org with the recipe contributions from gastroparesis fighters that want to share what recipes works well for them (and hopefully for you too). There are 251 recipes in total. Some are gluten free and dairy free as well. I am just so proud as I made it to the ‘Acknowledgement Page”, for helping out on the project!! The cost is $16 in the USA and $23 outside, postage paid. Until the new website it ready (soon, we hope! ), we cannot post an automatic link to purchase the cookbook. You may, however, order it online through Paypal or via snail mail. To pay through Paypal, sign in to your Paypal account and click on Send Money. Type accounting@g-pact.org in the To field, and the amount ($16.00 or $23.00) in the Amount field. Specify that you are paying for goods or services and click Continue. Select your Payment Method, select your Shipping Address, then scroll down to the Message box. 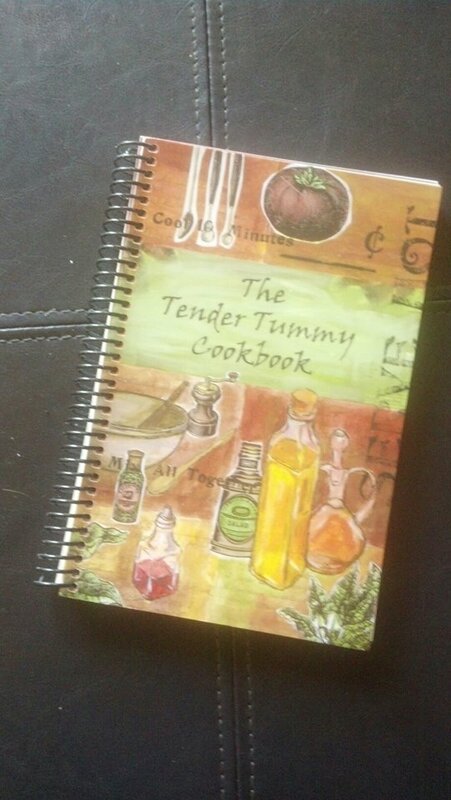 Type in The Tender Tummy Cookbook and click Send Money. You’re done! If you choose not to pay through Paypal, you may send a check or money order to: The Tender Tummy Cookbook, G-PACT, 185-132 Newberry Commons, Etters, PA 17319. Please allow 3-4 weeks for delivery. Any questions, please email cookbook@g-pact.org. G-PACT has been asked a lot recently about our support groups. Here is a list of groups we provide and the specialized focus of some of them. Support Groups: We provide multiple support groups for various issues and age groups. These groups are great places to exchange ideas with others and get some support from others who understand. Just about any question you have can be answered by someone in the groups usually. Groups are a great place to meet others online and have led to many in-person gatherings as well. Great relationships and lifelong friendships are formed. – largest online support group for GP and CIP on the web with over 3,000 members. – a community of support groups for a variety of conditions all in one location. G-PACT: Coping with Gastroparesis and Intestinal Pseudo-Obstruction- general group for all issues related to life with GP and CIP (aka: DTP- Digestive Tract Paralysis) – www.facebook.com/groups/GPACT. Great group to connect and meet others from all age groups and backgrounds. All DTP related topics are discussed here. It is a safe place to share feelings, ask questions, exchange ideas, and share experiences with others. Do not take any information provided as medical advice. Discuss all suggestions with your physicians first! G-PACT Middlers: Group for those in their 20’s-40’s trying to hold down a career, get married, start a family, or deal with dating issues. Group for those between college and nearing retirement to discuss issues related to the young adult years. www.facebook.com/groups/GPACTmiddlers. Wrinkled Guts- Maybe the name is humorous, but all of our guts are wrinkled. This group is for the late 40’s, 50’s and beyond members who need to discuss issues related to retirement, career, grandkids, adult children, and life with DTP as other age related health issues set in. Located at www.facebook.com/groups/wrinkledguts. New Group Added …. UPDATE …. 7-20-2013…. G-PACT Successfully Living with DTP — This group is for individuals dealing with milder forms of DTP who want a place to discuss their diseases in positive way.